They are hated by environmentalists and increasingly shunned by costconscious drivers, but many of Britain’s 4x4s are finding a new lease of life abroad. Foreign buyers are targeting these gas-guzzling workhorses and shipping them to countries with lower fuel taxes and poorer roads. 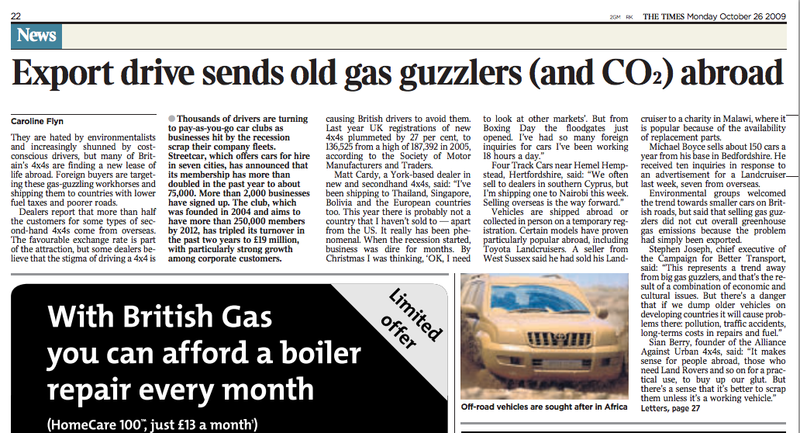 Dealers report that more than half the customers for some types of second-hand 4x4s come from overseas. The favourable exchange rate is part of the attraction, but some dealers believe that the stigma of driving a 4×4 is causing British drivers to avoid them. Last year UK registrations of new 4x4s plummeted by 27 per cent, to 136,525 from a high of 187,392 in 2005, according to the Society of Motor Manufacturers and Traders. Matt Cardy, a York-based dealer in new and secondhand 4x4s, said: “I’ve been shipping to Thailand, Singapore, Bolivia and the European countries too. This year there is probably not a country that I haven’t sold to — apart from the US. It really has been phenomenal. Vehicles are shipped abroad or collected in person on a temporary registration. Certain models have proven particularly popular abroad, including Toyota Landcruisers. A seller from West Sussex said he had sold his Landcruiser to a charity in Malawi, where it is popular because of the availability of replacement parts. Michael Boyce sells about 150 cars a year from his base in Bedfordshire. He received ten inquiries in response to an advertisement for a Landcruiser last week, seven from overseas. Environmental groups welcomed the trend towards smaller cars on British roads, but said that selling gas guzzlers did not cut overall greenhouse gas emissions because the problem had simply been exported. Thousands of drivers are turning to pay-as-you-go car clubs as businesses hit by the recession scrap their company fleets. Streetcar, which offers cars for hire in seven cities, has announced that its membership has more than doubled in the past year to about 75,000. More than 2,000 businesses have signed up. The club, which was founded in 2004 and aims to have more than 250,000 members by 2012, has tripled its turnover in the past two years to £19 million, with particularly strong growth among corporate customers.